Thanksgiving morning I photographed the Southern Tier Running Club’s annual tradition, the Pie and Glove 5K. participants in the race receive a pair of gloves and the race winner recieve pies as awards. There were 713 participants plus a great crew of volunteers working to make the race happen. Last year was the first time I had photographed this event. I waited at the finish line for the runners to arrive. I photographed them as they were running straight towards me at the finish line. This created head on photographs of people running. I think this resulted in some good photographs. However, I don’t like to do the same thing all the time. I wanted this years photos to have a distinct feel to them. As I have been learning and trying to improve my photography I’m learning what things I like and what I think looks better. I think that I like to get some photographs of runners from the side as they run by. I think this shows their effort and motion better than a head on shot. I also really like to find the nicest scenery I can at a location to have in the background for a series of shots. If I can do that I will zoom out and try to capture the runner along with some of the scenery in the shot. I think I was able to find a nice spot at the park to do this during the race. My standard gear setup for race photography has me using two camera bodies each with a different telephoto lens on it. One body has a 300mm telephoto lens with a 1.4 teleconverter for added zoom. The other camera body has my 70-200 zoom lens. This works great for standing at the finish line photographing runners as they approach. You can stand there and pick them out from a distance as the finish line is essentially a long straight away so its pretty easy to switch from one runner to the next and photograph everyone. In this method my 300mm lens is usually my primary lens. This tim planned on my 70-200 bein my primary lens and I ould switch between that and capturing some shots of more distant runners with my 300mm lens. As it turned out with the relatively short race and large number of runners there was not time to switch between lenses to capture distant and more close up shots. Runners where zipping by with almost no gaps after the first few runners. Taking photos from the side view meant I only had a limited range of time to get a shot of each runner and as I learned it was very quick. I have to get the shot as the runner run by this small strip of land where I am standing. I don’t have an over 100 meter runway within which to capture shots. So since I had no time to switch lenses I used my 70-20mm zoom constantly, which lead to my memory card filling up surprisingly fast and unexpectedly. Runners will still streaming by as I fumbled to switch cameras and reposition to a spot where the 300mm telephoto lens was effective at isolating each runner from the crowd and could focus on mor than just the runners head. I eventually got backed up all the way to the finish line and was able to continue photographing all the runners, but I regret the fact that I missed some of the runners. Each photography outing is a learning experience. This one more so than most. I really liked the location where I shot the race from. Not too far from the finish. A spot where the likely winner was mostly established. I could see the finish line. Runners were about as spread out as they would get. It was also a spot with some decent scenery for the background. So for next year I will plan to not use my 300mm lens for this race and instead I will use either my 60mm or 50mm lens on my second camera body. This way I will have multiple lenses that will allow me to shoot similar types of photographs like I am aiming for. If you would like to see the photographs that I took of the race check them out here and consider buying a print or download: Southern Tier Running Club 2017 Pie and Glove 5K. Let m know what you think of the images. These are all the unedited images from the race. So there are plenty of bad shots in with the good ones. Be kind. If you appreciate the work I do you can also support my work for as little as $1 a month on Patreon: https://www.patreon.com/KRNaturalPhoto The higher level you support at the more rewards you are eligible for. Thank you for your support. 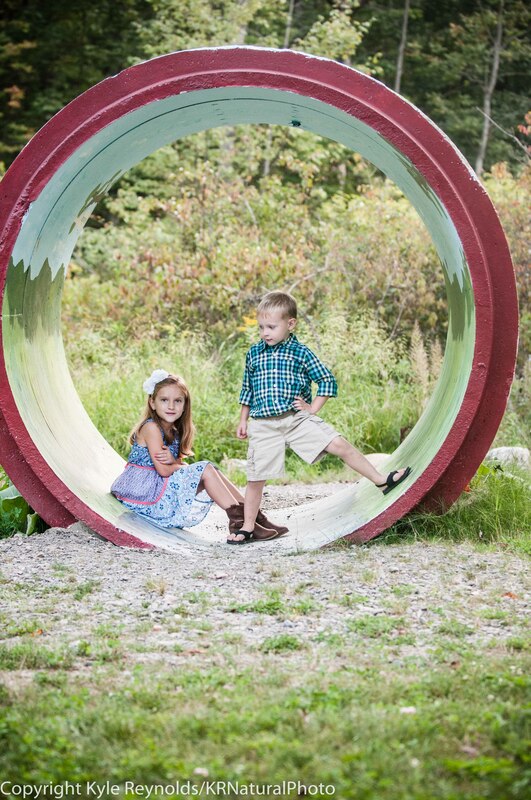 My niece Hannah and nephew Drew posing all on their own in the tunnel at the playground during their photo session. Drew and Hannah freestyle posing.